The first trophy that you can get after starting up Heavy Rain is one that thanks you for supporting interactive drama. It is easy to forget that, when the game was released back in 2011, it was a game which doubled down on the idea that video games were ripe for experimentation with the language of film. Despite the fact that Heavy Rain showed big promise back then, it has been surpassed in that regard many times over by now. It serves as a Rosetta stone to many of the basics we see echoed in the new class of adventure titles that have come in its wake. What makes this game such a frustrating experience is that when it works, it works so beautifully, but when it fails, it fails really hard. Well, the Heavy Rain does prove itself far ahead of its time in its approach to Quick Time Events, together with its use of the DualShock&apos;s motion-sensing capabilities to simulate movement, as well as the timed dialogue and split section reactions which can permanently change the course of the game. Well, combined with a great OST and remastered graphics, you actually have a game with an incredible promise. It has been enhanced for PS4 in the same manner as the Beyond Two Souls. Of course, the updated textures and rendering techniques all make the game&apos;s already impressive visuals even better, but there seems to be a few bugs and issues that weren&apos;t present in the PS3 original, consisting of occasional jittery animations and clipping issues. The core plot is sound: A serial child murderer called the Origami Killer is on the loose, and the narrative follows 4 different perspectives on the manhunt. Particularly, Ethan Mars - the father of the latest victim, Norman Jayden - a good FBI agent with a bad drug habit, Madison Paige - an insomniac journalist, and Scott Shelby - an asthmatic private investigator. Actually, from a high-level perspective, creator David Cage is able to well deliver on disparate ideas throughout the game. At varying points, you will find yourself nervously working your way through drug withdrawals of Jayden, or trying to appease Shelby’s asthma attacks fast enough to barge through a door and fight off a client’s violent boyfriend. The most infamous scene in the Heavy Rain is probably the one that perfectly exemplifies the game’s big problem: an attempted sexual assault in the apartment of Madison by multiple masked assailants. The scene itself is masterfully executed with great camera work, and your actions have weight, creating a hectic atmosphere very few games match. It is one of the best action sequences in a game that excels at them. The problem is, when the scene is over, it has a cop out, a bad dream. It is literal sound and fury signifying nothing. As the game goes on, it obsesses with the mundane, where nearly every tiny action requires your input. No matter how urgent the narrative gets, it’ll stop any sense of momentum dead to let a character feed a baby, or play golf with a rich guy, or just drink a glass of water. 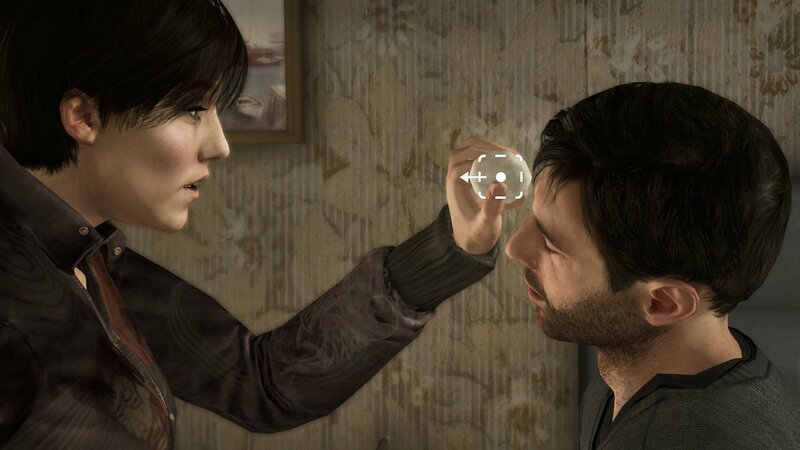 There is something to be said for focusing on small details to hint at a character’s state of mind, but Heavy Rain does not do a good job of tying these details into the narrative in a really meaningful way. It’d have been great if as much focus and attention went into the voice acting of the game. Out of the leads, Madison and Scott fare best, coming off as natural and human, while Ethan is stuck with an unshakable French accent.